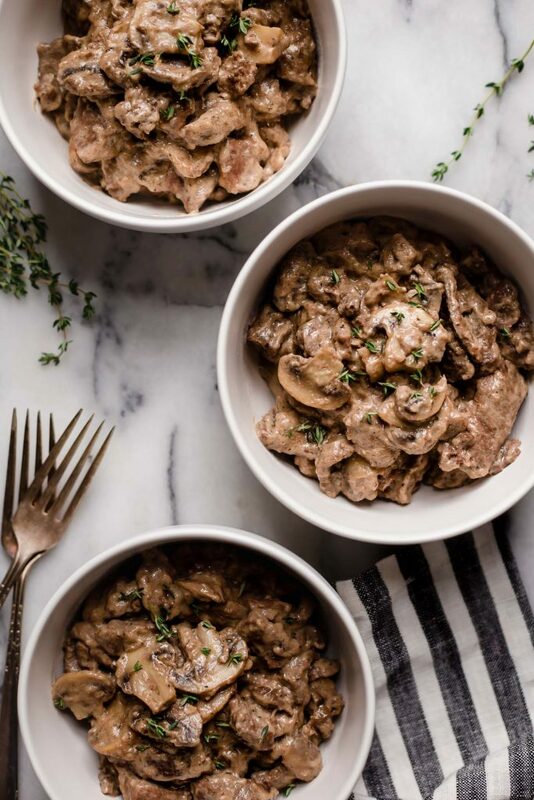 This delicious and easy keto beef stroganoff recipe is sure to be an instant family favorite! Looking for your new favorite filling low carb dinner? Look no further! 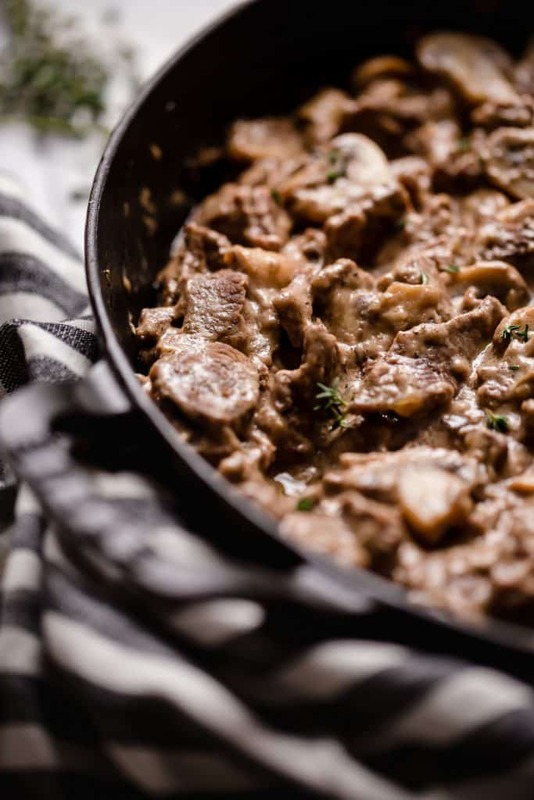 I’m sharing with you a recipe for the most DELICIOUS keto beef stroganoff. You are going to LOVE it! This is one of my favorite dishes to make because it is so comforting and cozy. There is nothing better than cooking up a nice, warm and comforting meal, especially on a cold winter night! Not only is this dish super tasty and cozy, it’s also quite easy to make. You have to give it a try! 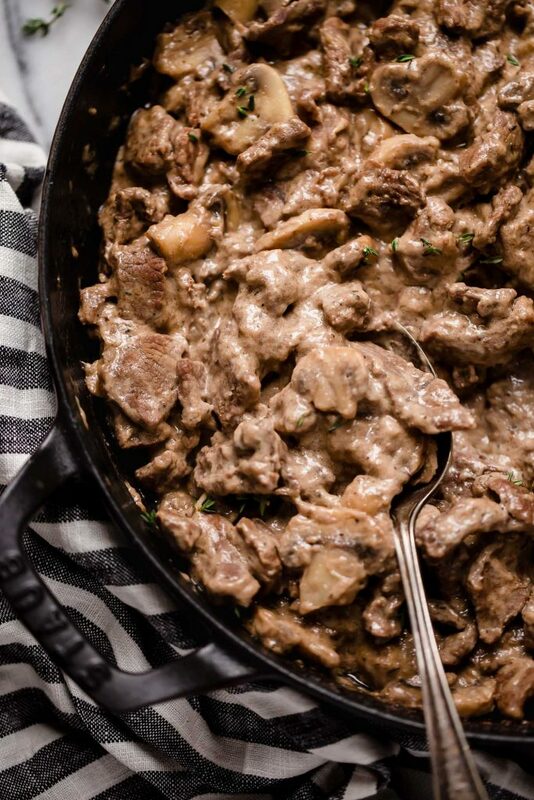 This beef stroganoff is SUCH a savory, filling dish. Included in this recipe are a bunch of totally delectable ingredients that all work together to create a HUGE flavorful punch. 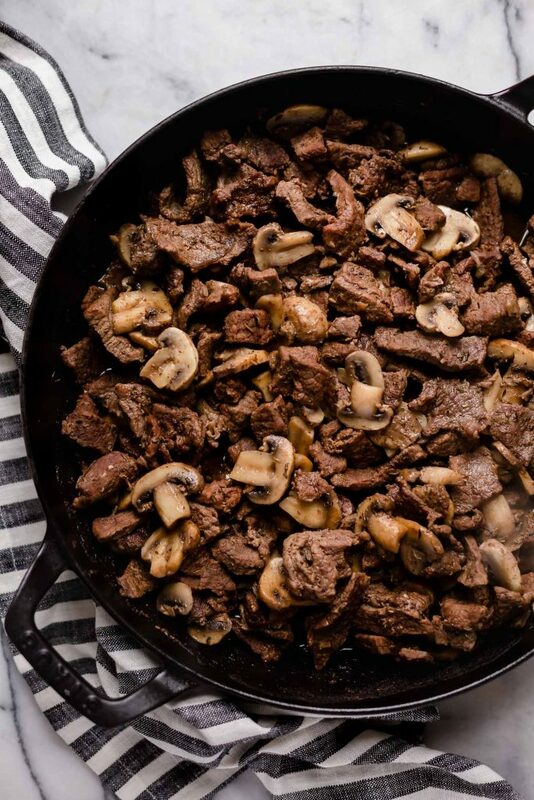 This recipe includes beef, mushrooms, onions, apple cider vinegar, sour cream, thyme, garlic, avocado oil, and a few other things! I like to use avocado oil because it’s such a healthy oil. It is made up of nearly 70% oleic acid, which is a healthy fatty acid that benefits the heart. This oil also benefits cholesterol levels, and compared to coconut and olive oil, it is the healthiest option! Apple cider vinegar is another ingredient that I love including in my recipes, because it is such a little power house. This vinegar is great for lowering blood sugar levels, making it super beneficial for those with type 2 diabetes! In addition, apple cider vinegar is beneficial to the heart, as it helps to lower cholesterol. If you have been following along on the Real Balanced journey, you probably know that I follow a ketogenic diet! I have found that the keto diet allows me to feel my absolute BEST, so I honor that and create meals that adhere to the guidelines! If you are unfamiliar with the ketogenic diet, I will give you a quick run down! Following a keto diet is all about allowing your body to reach and remain in “ketosis.” Typically, the body uses carbohydrates for energy. When it is out of carbs to use, it turns to fat and uses that as the energy source instead. Ketosis occurs once that switch is made, and the body is using fat as its source of fuel. That being said, it is important to remain conscious of your carbohydrate intake when you are following a keto diet. You want your body to be fueled by fat, not carbs! This recipe follows right along with that rule, as it is very low in carbs. Each serving of this dish only contains 2.4 grams of net carbs, making it the perfect keto recipe! This recipe yields 10 generous servings, making it the PERFECT dish for hosting friends or family. It is also a great dish to make if you like to meal prep each week! Personally, I would LOVE to partake in this super cozy dish each and every evening, especially since it’s now so frigid outdoors! There is nothing quite better than cozying up with yummy comfort food after a long, productive day, is there?! 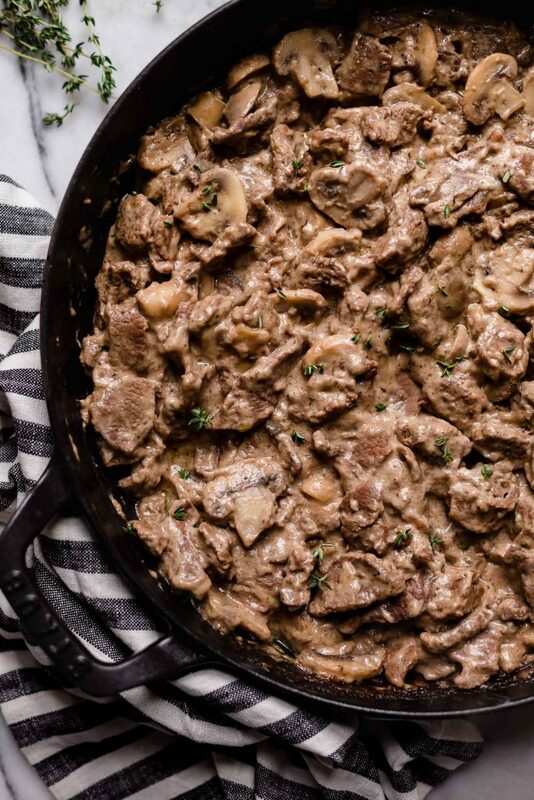 Check out how to make this super easy beef stroganoff! 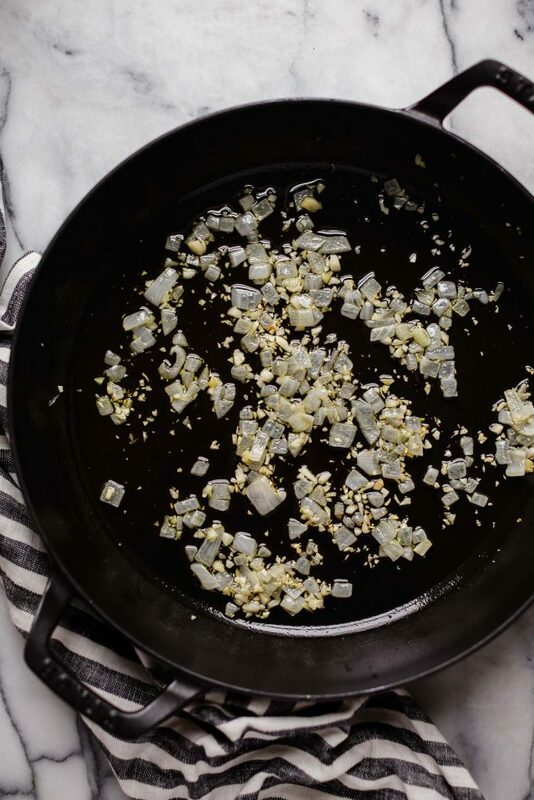 To a large saucepan over medium heat, add avocado oil, chopped onion, and minced garlic. Saute until onion and garlic are fragrant, about 3 minutes. 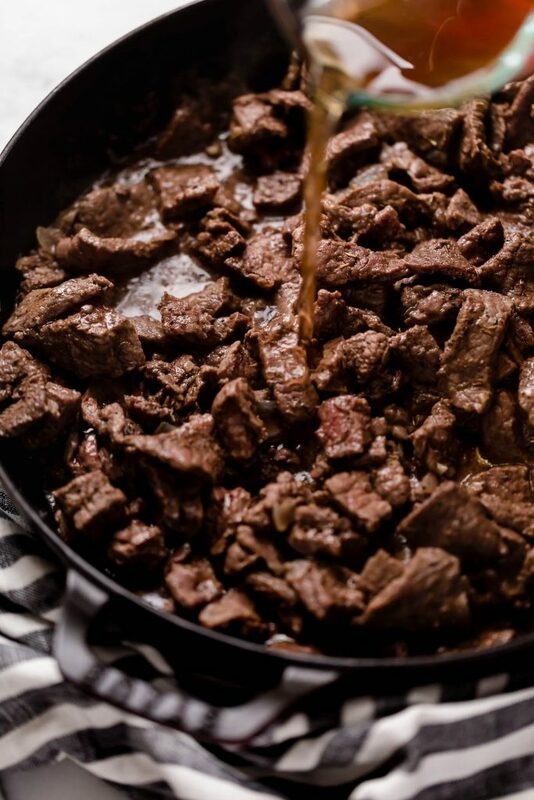 …saute until beef is cooked throughout, about 8 minutes, stirring frequently to brown each side of beef. Decrease stovetop heat to medium-low and pour in beef broth and vinegar into saucepan. Simmer mixture uncovered for 30 minutes. Stir in mushrooms, cover pan with lid, and simmer for additional 1 hour, 30 minutes. Remove pan from heat and stir in sour cream and mayonnaise until thoroughly incorporated. In ¼ tsp increments, stir in xanthan gum until liquid thickens. Return lid to pan and allow pan to sit covered for 10 minutes before serving in bowls. Serve, cozy up, and enjoy! Perfect for many diets and lifestyles! So many people can take part in enjoying this DELICIOUS recipe! It is compliant with SO many diets. 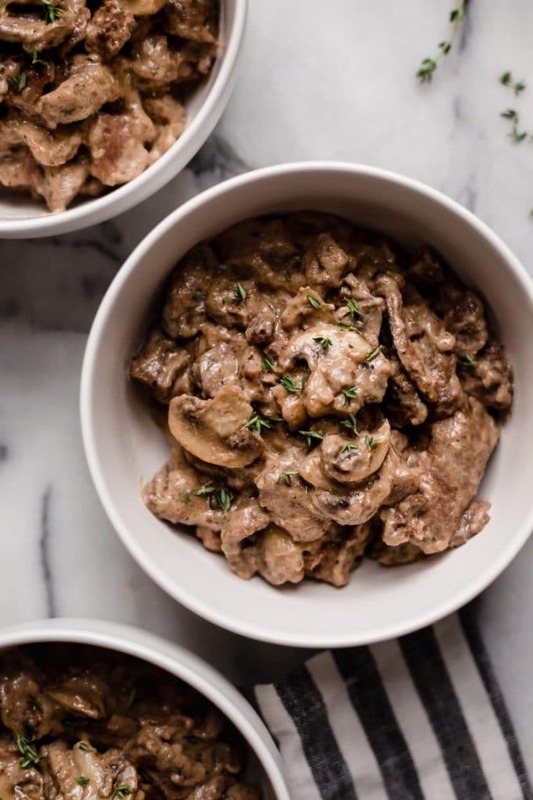 Keto and Low Carb: With a low carb count of only 2.4 grams of net carbs per serving, this easy beef stroganoff is TOTALLY keto compliant! Primal: This recipe follows primal diet restrictions and guidelines. Gluten Free: This ingredient list is free of wheat, barley, rye, and other gluten-containing products. 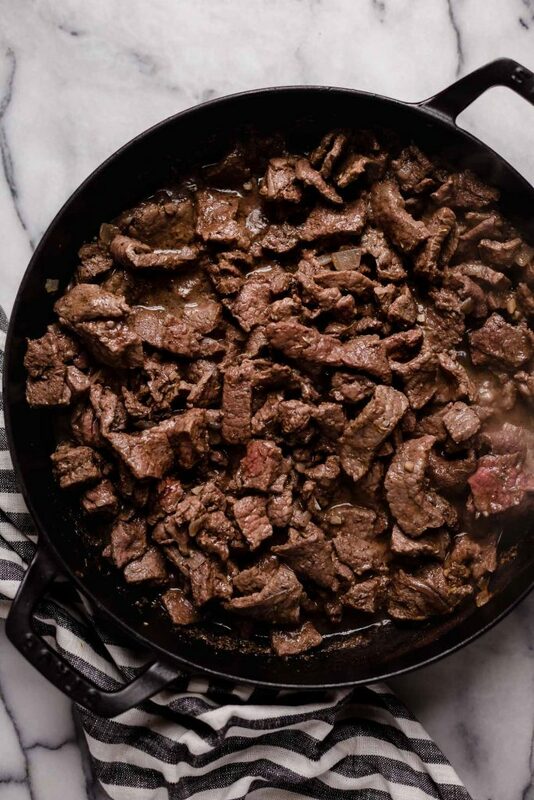 Grain Free: This keto beef stroganoff is grain free. 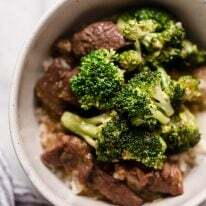 Nut Free: There are no tree nuts or peanuts in this beef stroganoff recipe, making it perfect for those with nut allergies and intolerances. Egg Free: This recipe does not call for eggs. 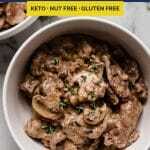 Sugar Free: Keto beef stroganoff is free of all sugar and sweeteners. Looking for more main dish ideas perfect for the ketogenic diet? At Real Balanced, ALL of my dishes are completely keto compliant! Check out these recipes for a dose of delicious, savory flavor! 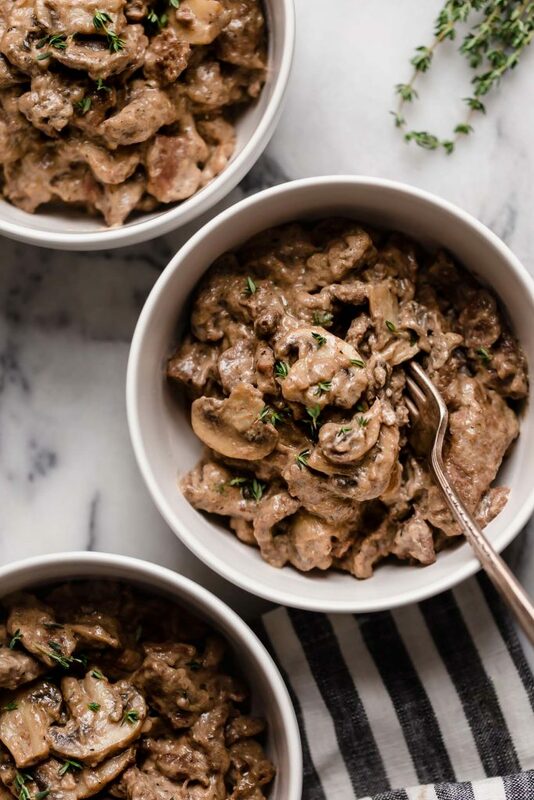 Beef stroganoff is about to become your favorite keto low carb dish. It’s creamy, delicious, and satisfying! 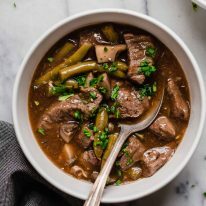 This keto beef stroganoff is really a comfort food favorite! Cutting against the grain, chop beef into ½” pieces. To a large saucepan over medium heat, add avocado oil, chopped onion, and minced garlic. Saute until onion and garlic are fragrant, about 3 minutes. 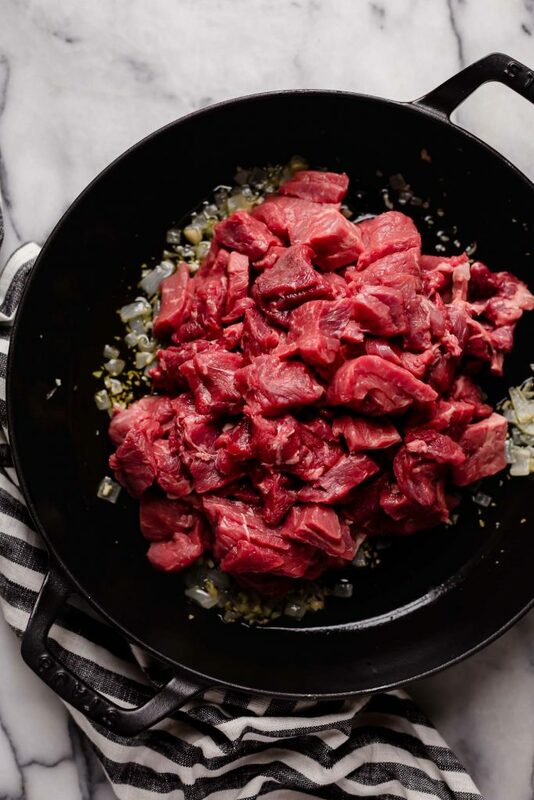 Add chopped beef, thyme, salt, and pepper and saute until beef is cooked throughout, about 8 minutes, stirring frequently to brown each side of beef. Remove pan from heat and stir in sour cream and mayonnaise until thoroughly incorporated. In ¼ tsp increments, stir in xanthan gum until liquid thickens. Return lid to pan and allow pan to sit covered for 10 minutes before serving in bowls. Amazing! took a little prep time but totally worth it. Thanks for sharing. This looks really good! I can’t wait to try it out. thank you!